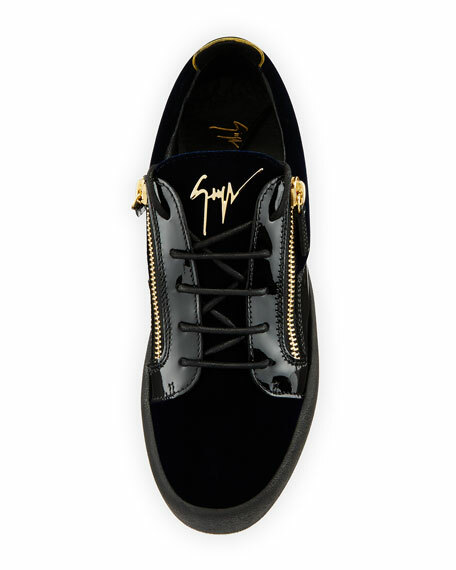 Giuseppe Zanotti men's low-top sneaker in velvet and patent leather. Contrast pull tab at back. Berluti low-top sneaker in calfskin and suede. Round toe. Lace-up front. Tonal topstitching. Logo-embossed patch at tongue. Contrast leather strap across vamp. Leather lining and insole. Dad sneakers. Made in Italy. Ermenegildo Zegna Couture low-top sneaker in smooth and Pelle Tessuta woven leather. Round toe. Crossed elastic bands at vamp. Lace guard flaps. Logo-embossed tongue. Looped pull at back. Padded collar. Leather lining and insole. Contrast rubber outsole. Made in Italy. Ermenegildo Zegna low-top sneaker in denim and calf leather. 1" flat heel. Round toe. Split vamp with crossed elastic straps. Ermenegildo Zegna low-top sneaker in denim and calf leather. 1" flat heel. Round toe. Split vamp with crossed elastic straps. Slip-on style. Leather footbed. Rubber outsole. Made in Italy. Ermenegildo Zegna Triple Stitch low top shoes in pelle woven leather. Round toe. Crisscross stretch vamp. Logo detail on back. Ermenegildo Zegna Triple Stitch low top shoes in pelle woven leather. Round toe. Crisscross stretch vamp. Logo detail on back. Slip-on style. Rubber sole. Calf/lamb leather. Made in Italy.